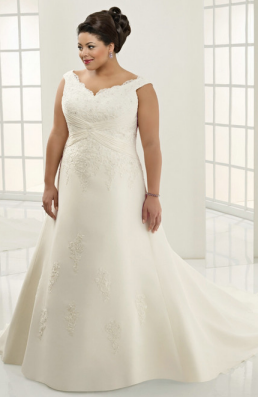 Are you looking for ivory wedding dresses because bright white just doesn't look good on you? Do you know there are more than two shades of white (ivory and white) found in bridal gowns today? There is actually a full spectrum of whites and ivory shades to consider. Before you ask to try on ivory wedding dresses, determine your skin undertones. This will help guide you to wear the best shade of white or ivory so your complexion will glow. And brides today are not limited to just shades of white. There is a definite trend towards color in general. You will see more and more blue wedding dresses, red wedding dresses, pink wedding gowns and even accents of color on traditional white gowns. So many choices -- right? Yes, but making the right choice starts with knowing your skin tone. It’s also important to know so you can pick a color scheme for your wedding that works with your skin tone too. You have flowers to consider and the colors of your bridal party. Remember, you will be taking pictures with your bridesmaids along with your flowers. Which Shade of White is Right for You? 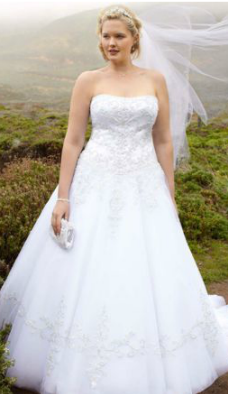 The traditional pure white wedding gown is not the best choice for most women. And some ivory wedding dresses are not the best choice either. Bright whites wash most women out or give them a sallow look. Ivory can have yellow undertones which is not good if you have cool undertones in your skin. If you are trying on pure white or ivory gowns and somehow you feel your complexion has lost its glow, then try on a different shade of white. You may notice how your complexion instantly warms up and looks healthy. There are many names given to “white,” but the bridal industry is standardizing the names to make it easier on brides which is really good news. The most common names used are Bright White, Champagne White, Ivory, Candlelight and Ecru. The hue of white you finally choose will also guide you in determining your bridal accessories and complimentary wedding colors. So before you fall hard for a particular dress, be sure to keep the gown's color in mind. We all know that once a woman has her heart set on something, it’s not easy to change. Champagne White - Champagne white is a soft, off-white shade with a pink undertone. It’s very close to a pure white, but it adds warmth to sallow or olive skin. For an even deeper shade, look for Rum white. Champagne white is one of the most popular whites for wedding gowns because it flatters so many skin types and still looks traditional. Bright White -This is the purest, brightest white you can find. This shade is so bright it almost lights up from within and can be gorgeous against dark skin or a deep tan. However, it does tend to sap the color from women who have fair or medium skin. Ivory - The non-white, white - There are so many shades of ivory that the name means very little. Ivories range from pale, off-white shades to antique ivory, which is similar to genuine, aged ivory pieces. Antique ivory will have a bit of yellow in it and is a darker shade, while eggshell is one of the lighter shades of ivory. Candlelight - This is a richer, darker ivory that leans toward beige. This shade is sumptuous and regal and is particularly suited to evening weddings. It has a depth of color and warmth that makes it suitable to a wide range of skin types. Candlelight also tones down any tendency toward ruddiness. Ecru - The darkest shade that you’ll usually be able to find for a wedding gown is Ecru, which is almost tan. It is very similar in color to unbleached linen, which is where the name Ecru came from. Be very careful choosing this shade; if it is too close to the actual color of your skin, your gown and face could blend together too much and you will fade into the background. Ecru looks best on very fair or very dark skin; the mid-tones tend to be too close to the Ecru color. So just don't pay attention to the style and fabric of a gown, but also keep in mind the shade of white that will make you glow on you wedding day. 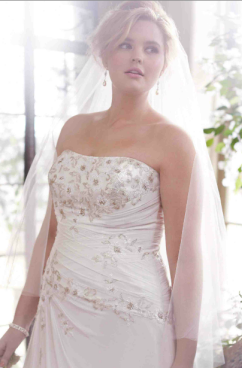 Before asking to try on ivory wedding dresses, know what color undertones look the best on you.